60W KangerTech KBox Mini Platinum TC MOD is the one of the most cost effective mod of Kangertech products.With spring loaded 510 thread,it can work with most of the 510 thread atomizer. 60W KangerTech KBox Mini Platinum TC MOD is the one of the most cost effective mod of Kangertech products.It supports wattage variation from 7w-60w, with the OLED screen, you can adjust the wattage as you like.There are ”+” and “-”buttons on the body of the mod so it is easy to operate.This 60W KangerTech KBox Mini Platinum TC MOD supports resistance from 0.1ohm to 0.3ohm, which is really great because this will bring you huge cloud and good flavor at the same time.Moreover, it supports TC and VW mod both.With spring loaded 510 thread, it can work with most of the 510 thread atomizer.And positively reduce the possibility of “no atomizer”.In one word,60W KangerTech KBox Mini Platinum TC MOD will not let you down. • Press fire button 5 times in succession to turn on/off the device. • OLED display will show "Kanger Tech" at standby mode. • Plug the Micro USB cord to charge the cell. OLED display charging until batteries are fully charged. • OLED display battery level, resistance value and output wattage. Nice updated features. It's a bit heavier than the previous one though and that's really the only slight that I can say about this. The 60W Kbox Mini works perfectly with my tank. 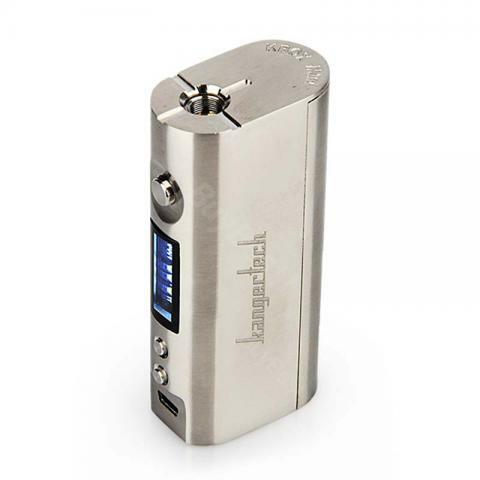 60W KangerTech KBox Mini Platinum 18650 TC MOD ist zwar nur 60w hat aber was drauf sieht sehr elegant aus und sehr handlich und sehr leicht zu bediehne. i am new to the vape thing, this kit was my first. but i gotta say, it surprises me and i think i will keep vaping because of it. I got this MOD as a gift for my father-in-law. Cause its easy and easy to use. According to my father, it's amazing and he just love to use it. For me, i've used Kanger e-cig for years, never let me down.